How many years has the nominee been a registered adult Scouter? List positions and number of years served. 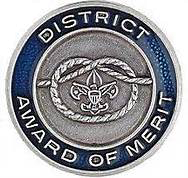 Include district committee, district program committee (e.g., event chair, event staff), membership committee (e.g., fall recruiting chair), finance committee (e.g., FOS presenter, Scout Fair Coupon Book chair, district popcorn chair), advancement committee (e.g., Eagle Scout Board of Review member), district training team, commissioner service, Order of the Arrow service, council/regional/national service. Describe service of exceptional character upon which this nomination is based, be specific. Include service to youth in Scouting and outside of Scouting. Provide specific examples. Why should this individual be considered for the District Award of Merit.